(mPOS) Mobile POS Terminals Market size was estimated at around USD 17 billion in 2017 and is unit shipment is expected to grow at over 18% CAGR from 2018 to 2024. Consumer adoption of mobile payment, NFC, and IoT technologies has alleviated the acceptance and demand for advanced solutions, thereby driving the growth of the mobile POS terminals market. The low cost of the devices such as handheld terminals, tablets, card swipe dongles as compared to cash and register systems is expected to drive mPOS terminals market growth over the future. Ease of deployment and enhanced Return on Investment (ROI) have significantly boosted the market growth over mobile POS solutions. The surging consumer use of EMV and chip cards as well as smart card EFT (Electronic Funds Transfer) payment modes is estimated to drive the mobile POS terminals market growth. However, data security concerns and rise in cybercrimes are expected to act as pitfalls for mPOS terminals market growth. The provision of compensating controls for managing data flow and improving security through data encryption and firewall can help in overcoming data security concerns. The mobile POS software market is forecast to surpass USD 10 billion by 2024. The proliferation of tablets/smartphones and ubiquity of internet connectivity are expected to surge the demand for mobile apps. Advanced software features include integration with screen terminals and barcode scanners thereby providing back-up and data restore features. 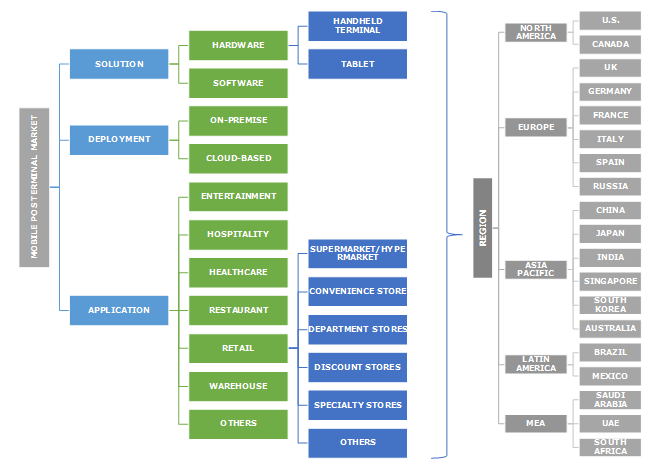 Software developers such as AccuPOS, eMobilePOS, QVS Software, Inc., focus on creating software, mobile apps, and storage mechanisms in addition to functionalities such as cloud data back-up, managing, and reporting of consumer data, inventory management, and sales transaction control. Hardware manufacturers including Verifone, Ingenico, First Data, and PAX Global Technology provide handheld terminals, tablets, and mobile computers. The low initial investment and the affordability of hardware solutions coupled with enhanced user experience are expected to spur the market growth. Cloud-based mPOS terminals market is expected to grow at 20% CAGR from 2018 to 2024, primarily due to its ease-of-operation and storage facility. Several new vendors have been developing SaaS-based solution including Touchbistro, Toast, Square, StoreZigo and Springboard Retail. Cloud solutions offer better functionality and user interface as compared to on-premise software. The demand for on-premise solutions is expected to witness slower than average growth rate owing to the lack of flexibility and scalability offered by such systems. However, the segment dominates the global market by deployment and this trend is expected to continue over the forecast period owing to data security concerns associated with cloud solutions. The demand for integrated software that supports multiple processes including customer management and inventory control is expected to drive the demand for on-premise solutions. NCR CounterPoint, POSExpress, and AmberPOS are a few examples of the on-premise solutions available in the market. Increased demand across end-use industries, such as hospitality and retail, is expected to surge mPOS terminals market growth. Businesses in these sectors benefit from the technology for payment processing and enhancing the consumer experience by curbing wait times and long queues at the checkout counter, generally associated with traditional register systems. The demand for mobile POS terminals has increased considerably over the past few years owing to increased deployments across retail formats, departmental stores, and regional markets. For instance, The Home Depot, Nordstrom, Apple, Inc., Urban Outfitters, Gucci, and Disney stores are some of the early adopters of mPOS terminals. The reduction in Total Cost of Ownership (TCO) and improved ROI offered by mPOS terminals solutions has considerably increased demand across SMB applications. The solution enables small retailers and SMBs to improve labor efficiency and enhance consumer satisfaction. The retail segment accounted for 30% market share in 2017. 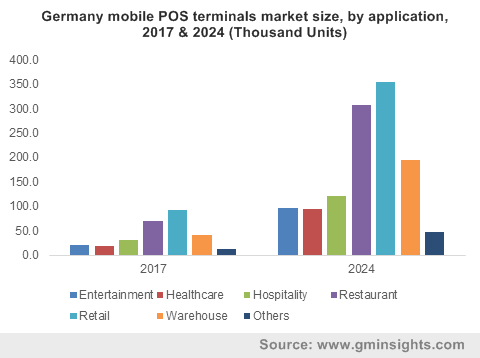 The U.S. mPOS terminals market dominates the global market owing to rapid pace technology adoption and rising demand across industries verticals in the region. The shift toward EMV chip-based card payment, particularly in the U.S., has driven upgrades of existing systems in the region, thereby favorably boosting market growth. Asia Pacific market contributed over 20% to the revenue share in 2017, with the rising trend of mobile payments and growing sales volume of e-commerce transactions factoring in as the chief growth drivers. In India, since the demonetization in 2016, the industry has witnessed a sharp growth due to the influx of digital payments in the region. The Latin American mobile POS terminals market is anticipated to exhibit the fastest growth on account of the rapid penetration of tablets and smartphones in the region and increased demand from SMBs across Mexico and Brazil. The sharp growth in the retail sector in the region is expected to drive the growth of the market in the region over the forecast period. Industry players have adopted various strategies such as acquisition, technological innovation, investment in Research & Development (R&D) and price differentiation to gain a competitive advantage in the mPOS terminals market. For instance, in June 2017, Verifone launched the portable Verifone V240m and standalone Verifone e285 solutions built on its propriety Linux-based platform. The global mobile POS terminals market is expected to consolidate over the forecast period with several established vendors in the software industry targeting acquisition of independent mPOS solution providers. For instance, in September 2014, Oracle acquired MICROS Systems, mobile point-of-sale hardware, and software solution provider for USD 5.3 billion. Furthermore, In January 2015, Ingenico announced its complete acquisition of Roam Data, Inc., a mobile point-of-sale solution provider. Additional strategies adopted by vendors in the mobile POS terminals market include strategic partnerships and collaborations for business expansion. For instance, in June 2017, TouchBistro collaborated with Square to enable process payments using Square on the TouchBistro iPad mobile app across the UK. Similarly, in January 2015, Verifone and partnered to deliver Android-based solutions, mainly targeted for large retailers. The benefits offered by mobile POS systems include reduction in TCO, ease of installation and operation, and scalability of the solution. However, data security and reliability concerns related to mobile devices and the spur in cyber-crimes may restrain the global mobile PSO terminals market. Companies have been focusing on strategic acquisitions to gain a competitive edge. For instance, in 2016, Upserve, a restaurant platform provider, acquired Breadcrumb, a company that offers cloud-based solutions. The rising popularity, demographic shift, and change in consumer preferences toward card-based payment channels are expected to spur the mPOS terminals market growth over the forecast period. The ease of cashless transactions promoted by the availability of mobile wallet payment channels and proliferation of mobile apps can be attributed as the key enabler for technology adoption across industry verticals. Mobile solutions enable business owners to process payments at remote locations thereby enhancing overall customer experience. Additionally, small business owners can easily convert a mobile device into a checkout terminal through a downloadable mobile app. Thus, low initial costs have encouraged penetration and the growth of the market. Furthermore, the rising internet penetration across developing regions including Brazil and India has further accelerated the conversion of mobile devices into checkout terminals.